Summer is more fun when girls are inspired to discover a new passion, become a stronger athlete, or learn a new skill. Online registration for camp is now open. Have a question about a camp? Our Connelly Dance Studio and classrooms will welcome dancers in grades 3 and up for a multi-level dance intensive camp to develop skills, flexibility, and strength through ballet, jazz, contemporary modern, and hip-hop dance. This full-day program gives beginner through advanced dancers the opportunity to explore choreography, costume design, stage makeup and theatrical lighting. The program will include a daily swim time and is led by Notre Dame's Dance Program Director, Pam Devenney. The week will conclude with a performance for friends and family. Notre Dame's science teachers open our labs for a full-week of fun science experimentation designed to encourage exploration, creativity and problem solving. Campers will create colorful, bubbling chemical reactions; create electronic circuits with LEDs and sensors, build and program their own robot to take home; make slime; and more! Camp includes swim time. 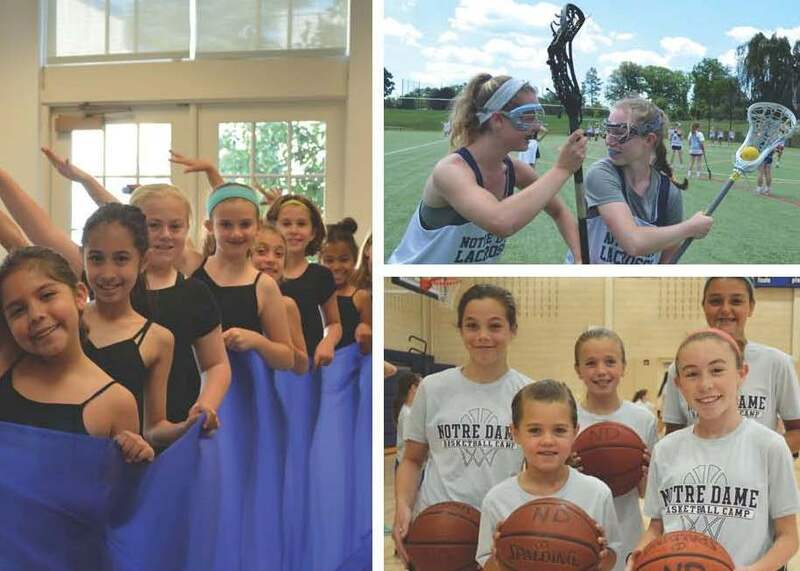 Notre Dame’s Youth Basketball Camps are for girls entering grades 1-9 in September 2019 and offers skill building and team play combined with fun activities. Half-day camp is offered for girls entering grades 1 and 2 and full-day camp for girls entering grades 3-9. Players get to learn the game in Notre Dame’s state-of-the-art athletic facility with ND's head coach, Lauren Thomer. This camp provides top-quality instruction from experienced Notre Dame staff. High intensity skill sessions and games will challenge players to elevate their game to the next level and prepare them for the upcoming season. Notre Dame's rowing camps at the Hines Rowing Center in Conshohocken will introduce middle and high school athletes to all aspects of the sport of rowing, including technique, training, and conditioning. Athletes new to the sport will learn how to use the rowing ergometer to build endurance. Experienced athletes will focus on improving their overall rowing technique, while learning to “move” a boat with rhythm as a cohesive unit. Through rowing and team building, each athlete will develop personal strengths, motivations, and behaviors that lead to success in any sport. This elite level camp is for high school players who are serious about raising their game. Players will develop linear and lateral speed, an explosive first step, conditioning, agility, balance, hand-eye coordination, basketball IQ and much more. The coaching staff, with more than 20 years of combined playing and coaching experience at the college level, is committed to helping players develop high level basketball skills, while enhancing their speed, quickness, and agility. This 9-week program is limited to 20 participants to ensure an optimal learning experience and individualized attention from the coaching staff. Experience the tradition of Notre Dame Lacrosse and learn from one of the most experienced (NCAA D1 playing and coaching experience) coaching staffs in the InterAc. Players will learn new conditioning and injury prevention training, build lacrosse skills, participate in game-like drills, improve lacrosse IQ, and compete at a top level with the current Notre Dame varsity team. Work on your soccer specific fitness during this 6 week program. The sessions will be run by the Notre Dame Head Varsity Coach Steve Wilman and will focus on work with and without the ball to improve each players overall soccer fitness levels. The High School Soccer camp is led by Notre Dame Head Varsity Coach Steve Wilman, who brings more than 20 years of experience to the sport. Coach Wilman holds a Premier Diploma, the highest level of certification, from the National Soccer Coaches Association of America. The camp will focus on skill techniques and functional play to get the players ready for the upcoming fall season. Participants will work on strokes, footwork, fitness and match-play scenarios to assess skills. Please note team tryouts will follow camp on Thursday, Friday, and Monday from 12:00 pm-6:00 pm. Two, one hour online instruction or assignments will be provided June-August. A detailed schedule will be provided in June. This accelerated course is designed to teach students basic First Aid and CPR techniques in order to prepare them to properly handle medical emergencies. This class will present knowledge related to understanding, recognizing and treating a variety of common injuries. Students will learn how to perform CPR and understand how to recognize emergencies that require advanced life support. Students will also be introduced to the cardiovascular and musculoskeletal systems, including how the heart functions and the role of bones and muscles in the body. This course will be hands-on and will include practical application of knowledge through First Aid and CPR demonstrations. Successful completion of this course fulfills the Academy of Notre Dame Grade 10 Health requirement. CPR Certification is provided by the American Red Cross. Notre Dame is proud to be a host site for iCan Shine Bike Camp and Future Stars Day Camps. iCan Shine provides quality learning opportunities in recreational activities for individuals with disabilities. By creating an environment where each person is empowered to maximize their individual abilities, everyone can shine! The camp runs from June 24-28, visit their website www.icanshine.org for more information. All ND Students are welcome to volunteer and will receive service hours for their participation. Future Stars Camp will be offered on the Academy's campus from Monday, June 19 - Friday, August 23. Click here to learn more. Download a 2019 Summer Camp Guide here.